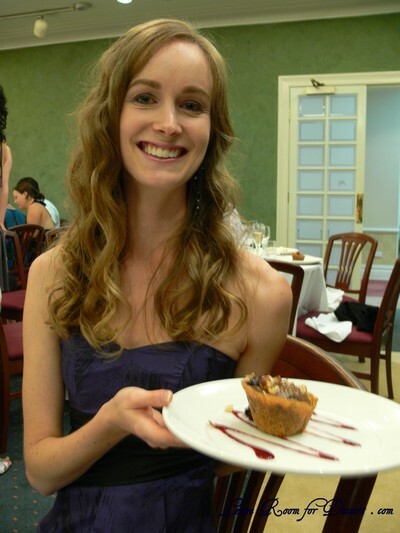 I am very excited to have come to the end of my first year of food blogging. What better way to celebrate, than by posting the recipe of the dessert in my header (at least the one at the moment – it may change in the future). I love the look of this dessert. It looks like something that could be served in a restaurant and tastes like that’s where it belongs. Many people have asked for this recipe, so it’s about time I posted it. This recipe took me two nights to prepare, although each step was quite easy and little work is required on the night of a dinner party – which is exactly how I like it, more time spent with guests the better. I made the Vienna almonds the first night, although these could easily be bought. The second night involved making the chocolate cones and assembling everything, with only the chocolate sauce made on serving night. This dessert tastes lovely. Like a soft vanilla ice cream with crunches of toffee Vienna almonds and hits of nougat. It works so well. I hope you enjoy it. 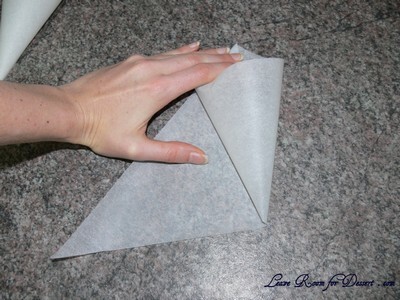 Cut five or six 25cm squares out of baking paper. Fold squares diagonally and cut to form 10-12 triangles. Place the triangle on the bench so the longest flat side is closest to you and the main point is facing away. Pull and twist the point on the right hand side up to join with the main point. Pull the left hand side point around the first twist to make the cone. Staple in place. 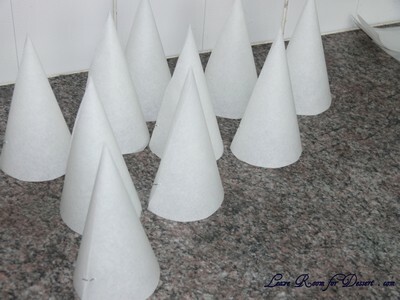 Cut around on the bottom to make a smooth edge and ensure the cone stands upright. You may need some holders for your cones – either use glasses, if they will fit – or fold a piece of paper in half length ways and twist to form a cylinder, staple in place (it will look like a toilet roll holder). Melt the white chocolate in a bowl over simmering water. Use the back of a spoon to coat the inside of the cones with an even layer of chocolate. 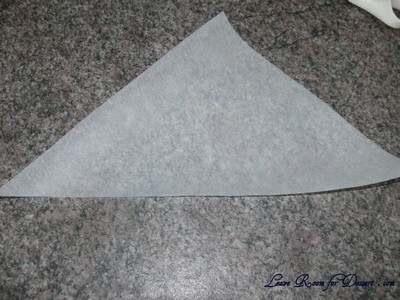 (If it is too hot, make a smaller cone out of paper or cardboard to hold the baking paper cone). Stand cones in a glass or made holder. 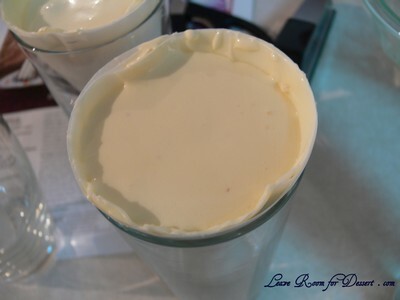 Beat thickened cream in a medium bowl until softly whipped. Beat the eggs with the sugar and vanilla in a large bowl until lighter in colour and thickened. Fold the cream lightly into the egg mixture, half way through, add the nougat and around 100g Vienna almonds and finish folding through. 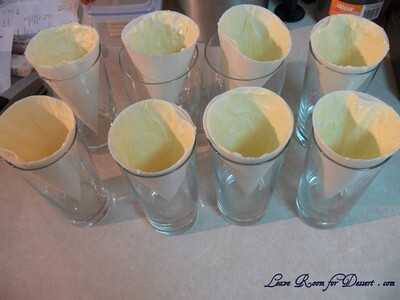 Scoop the mixture into each of the cones and place in the freezer for a few hours or overnight, until firm. Place the dark chocolate and cream in a bowl and heat in a microwave in 10sec 50% power bursts, stirring between each burst, until the chocolate has melted and combined with the cream. 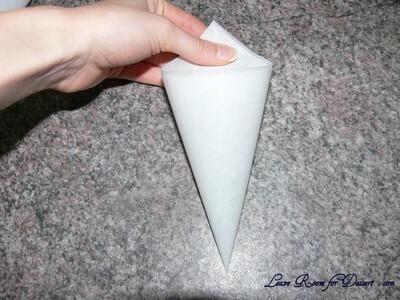 Place in a piping bag/squeeze bottle or make a piping bag by using a plastic zip lock bag or by making another cone out of baking paper and cutting off the end. 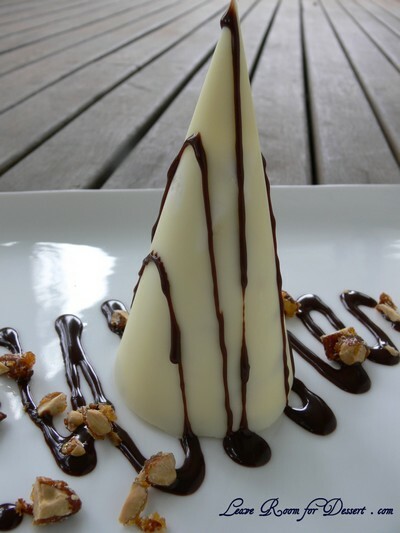 Remove baking paper from white chocolate cones and place on the plate. 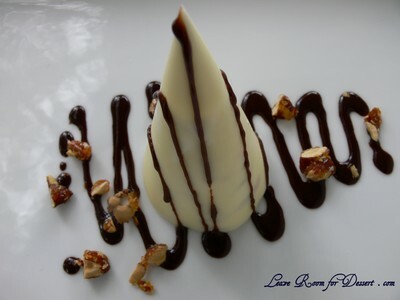 Drizzle with chocolate sauce and scatter the remaining Vienna almonds. Serve. Filed under Chocolate, Dessert, Ice Cream, Recipes. You can follow any responses to this entry through the RSS 2.0 feed. You can leave a response, or trackback from your own site. 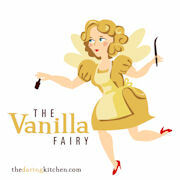 Sometimes I just have to shake my head in awe when I visit a website and see recipes that look so AMAZING! It’s usually the case when I visit yours! 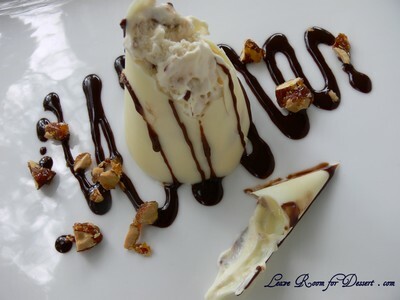 This is an amazing dessert and a great way to celebrate your anniversary! That looks absolutely amazing! Perfect for celebrating your first anniversary! 🙂 CONGRATS!!! And seriously, I can’t get enough of the yummy looking cones! Those are definitely fit for the most exclusive of restaurants! What a great job you did, Anita. 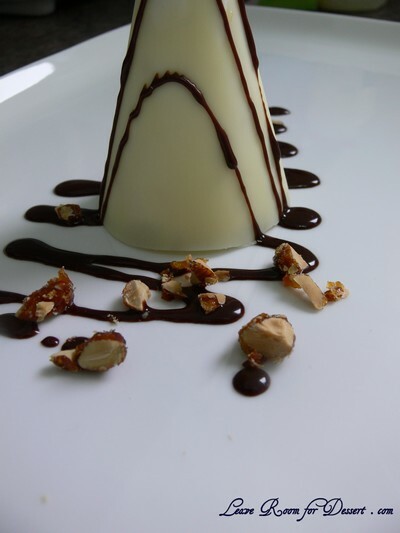 The Vienna Almond Semifreddo looks delicious and what fun to break off the top and discover it! congratulations on a full year! You’ve achieved a lot, cooked numerous delicious treats, and look like you’ve had a blast doing it. Here’s to another year. These are so fancy! The cream filling sounds so good. Congratulations on a year of blogging, and I am looking forward to reading your posts during the year to come! Happy first blog anniversary!!! Look forward to your future posts! Very happy anniversary sprinkled with many congratulations. Oooh loving the fact that you don’t need to buy special equipment for this! I thought they were special cone moulds! 😮 Fab idea Anita! That’s a very professional-looking dessert! The pieces of nougat and Vienna almonds in the icecream sound beautiful. Congratulations on your first year of blogging. I know how much you have enjoyed it and I have certainly enjoyed being the recipient of the beautiful foods that you have created! I am looking forward to the next year of your food adventures. 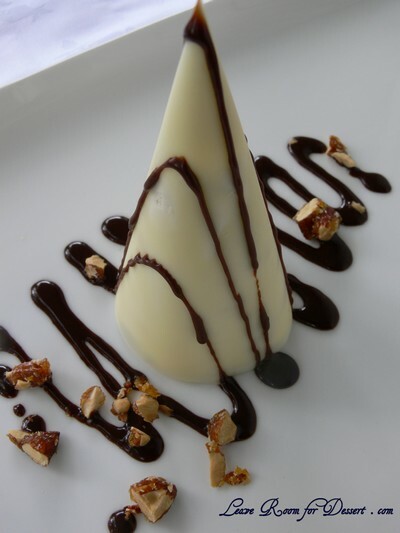 The White Chocolate Cones with Nougat and Vienna Almond Semifreddo have to rank up at the very top of the desserts that I love – unfortunately for my waistline I love all your cooking, particularly the desserts!!!!! I wish you all the best in your cooking adventures. Happy Blog Anniversary! This looks elegant and so amazing! Happy first year of blogging! This is an impressive looking dessert. wow! You’re so clever. It looks brilliant. Congratulations on your first year fellow foodie Blogger! I can’t seem to see the end of my first year blogging tunnel as I am only 2 months old – lloooooonnngggg way away. I am looking forward to following round 2 of your food adventures. This White Chocolate Cones with Nougat and Vienna Almond creation of yours looks like 7th Heaven & if we were on the same continent I’d say to heck with my ever expanding hips & gorge of this! Excellent job & blog on!!!! Aren’t you just a clever trevor?!!??!?! These look soo delicately amazing!!! Beautiful! 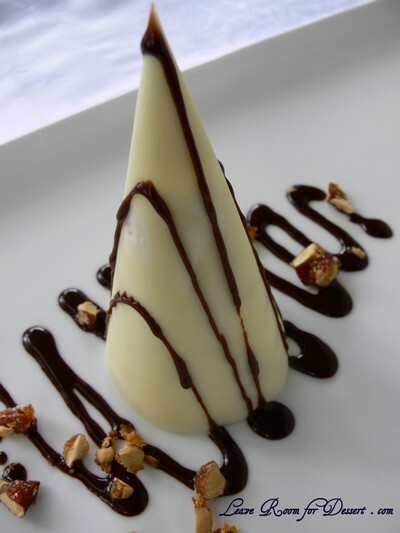 Those semifreddo cones must taste heavenly! Great presentation, as usual. My, what an elegant dessert, and I bet it’s delicious as well. Happy blog birthday!! Thats such a beautiful dessert, and all this time I thought it WAS a restaurant dessert!! Fantastic job! You’re right- this looks like something served at an expensive restaurant! It’s so pretty and elegant that I’m tempted to make it- just to look at it! Congratulations on your blog anniversary! Holey Moley! That’s one impressive looking dessert. I think my eyes would pop out of my head if I got this at a restaurant. Stumbled on your website yesterday and made these last night….. Thankyou….. they were amazing, everyone loved them. They set in just 3 hours, phew! Served the remainder just now to the kids, ran out of vienna almonds, so crunched up a few ameretti biscuits, for decoration, which worked very well. 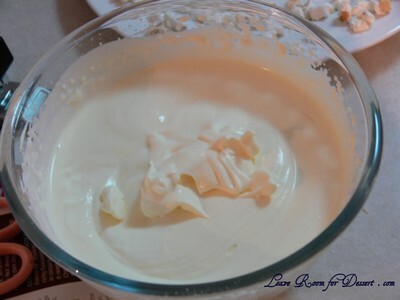 This looks lovely…..I plan to make it for my dads b’day as he loves white chocolate…..but I was wondering if adding a few chopped up fruits in the cream would taste nice? I have made these a couple of times already. They can be made well in advance, which is great when you are hosting a dinner party and are a lot easier to make than they look – your guests will be so impressed.